On June 6, the University of Santo Tomas became the first school to celebrate Jose Rizal’s 150th birth anniversary, which coincides with UST’s 400th anniversary. The event was attended by singer Chris Villongco, who will play Maria Clara in the Cultural Center of the Philippines’ staging of Noli Me Tangere. Reverend Father Rector , Fr. 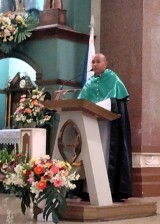 Rolando V. de la Rosa, O.P., Fr. Florentino Bolo, Jr. , Secretary General and Master of Ceremonies, Dominican fathers and members of the Thomasian community, congratulations on the 400th anniversary of UST which so auspiciously coincides with Rizal’s sesquicentennial. UST is the first school to celebrate Rizal’s 150th birth anniversary. It fittingly highlights the fact that Rizal is UST’s most outstanding alumnus! Congratulations to you! My Rizal, a group of Rizal family and friends whose mission is to encourage all sectors of society to celebrate Rizal’s sesquicentennial in a meaningful way, invite all of you to attend Maligayang Bati Jose Rizal, an open air birthday party for our national hero on June 19, at Fort Santiago, from 6 pm to midnight. We also invite you to view our My Rizal website to view the calendar of interesting and fun Rizal themed activities throughout the year. 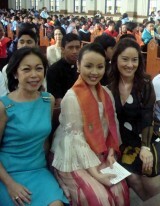 One of them is the CCP’s staging of Noli Me Tangere, where I will play Maria Clara. Fr. 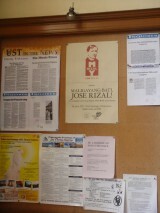 Regelado Trota Jose, UST's head of Archives. I. THE PHILIPPINE NATIONAL ANTHEM. Before we proceed with the Discurso de Apertura, we acknowledge one significant occasion that the whole nation will be celebrating in a couple of weeks – the 150th birth anniversary of Jose Rizal, an illustrious alumnus of the University of Santo Tomas. As a fitting tribute to a distinguished son of UST, the University will also be holding programs and spearheading projects to highlight the impact of Jose Rizal to Thomasians and to the nation. One of these endeavors is today’s Opening Rites to begin the academic year. As UST pays tribute to Jose Rizal, please welcome, to sing Sinisintang Bayan, a song that echoes the Filipinos’ strong sense of nationalism and nationhood, in the same play where she takes on the role of Maria Clara, Ms. Cris Villongco. Welcome to the official opening ceremonies for the Academic Year 2011-2012. It is, indeed, timely that the Sesquicentennial Anniversary of the birth of our National Hero coincides with the Quadricentennial celebration of the birth of his alma mater, the University of Santo Tomas. The impact that Jose Rizal’s life and works made to the world is a moving testimony to the University’s lasting legacy of forming the minds that build the family, the nation and the church. Since 1866, it has been the tradition of our University to mark the opening of the academic year with the Discurso de Apertura. Distinguished members of the academe have been invited to deliver relevant and scholarly treatises that represent UST’s dedication to research and development. The professional accomplishments of those chosen to deliver the Discurso de Apertura also serve as an inspiration to others, especially the students, to aspire for a high level of achievement in their respective careers. This year, as UST commemorates its 4th centenary of foundation, the University celebrates by looking back and taking a glimpse of its rich history through the eyes of one of the University’s foremost historian and archivist, Fr. Fidel Villarroel, OP. To present his work, we have chosen Prof. Regalado Trota Jose, Archivist of the University to deliver the Discurso de Apertura or Opening Address entitled “Facebook Flashback: The Archives and the Story of the University.” Prof. Jose will be escorted to the rostrum by Dr. Clarita D.L. Carillo, Vice-Rector for Academic Affairs and Rev. Fr. Pablo T. Tiong, O.P., Vice Rector of the University. Thank you Prof. Jose for treating us to a rare glimpse of the past not only of our University, but also of our National hero. I’m sure that we have all been enriched by the very interesting and informative presentation of Prof. Jose. And thank you also to all the members of the UST community whoa re here to witness the opening rites of the academic year 2011-2012. After this, we shall proceed to the UST Central Seminary gym for some refreshments. V. HYMN OF THE UNIVERSITY OF SANTO TOMAS.